It seems hockey and violence have always gone hand in hand. Take, for example, the very first recorded hockey game in history. On March 3rd, 1875, James Creighton and his hockey pals played the very first indoor hockey game at Montreal's McGill University. The game is universally important as it featured the first ever set of written rules, standardizing the game. The always evolving game of hockey as we know it today was "born." Ever since fighting and violence have long played a role in hockey history. Heck, those really old days make the Broad Street Bullies look like saints. Did you know at least twice in Canadian history players were up on murder charges? This dates back years before anyone had heard of a National Hockey League. Charges were all dismissed. Compared to those wild times or even compared to the 1970s, hockey violence is a little more in check. Yet we still have Bill Masterton and Don Sanderson dying on the ice; Mike Milbury beating up a fan with a shoe; Todd Bertuzzi mugging Steve Moore; Marty McSorley slashing Donald Brashear in the head; head injuries causing long term side effects were only now beginning to fully understand; and a long list of superstar players in hospital or leaving the game altogether due to injuries. All the while the NHL actually condones on-ice violence as a ticket draw (even if that leaves stars like Sidney Crosby in hospitals rather than hockey rinks), diehard hockey fan and expert Adam Proteau argues against hockey's status as a blood sport. 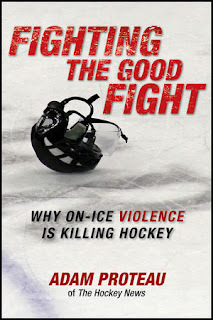 In his new book Fighting the Good Fight: Why On-Ice Violence Is Killing Hockey , Proteau sheds light on the many perspectives of those in and around the game, with interviews of current and former NHL stars, coaches, general managers, and league executives, as well as medical experts. Proteau is the funny and thought provoking columnist for The Hockey News known for his anti-fighting stance. But in his youth he was quite different. He was the goon. He was over-sized, aggressive kid in his youth league. Fighting, violence and suspensions were once his game. He was even nearly suspended for life for a nasty stick swinging incident. Somewhere along the line his perspective shifted. And now he goes toe-to-toe against the long established old guard of hockey, arguing that violence in hockey needs to be curtailed for business, medical and moral reasons. He has become the vehement anti-fighting voice in hockey. He talks with medical experts on head injuries and concussions. He talks with players, coaches, managers and experts about head shots, aggressive bodychecking, injuries and discipline. But ultimately he wages his own war against the supposed value of fighting in hockey. Furthermore he expands his attack to the entire established hockey culture. Hockey culture is where this battle must ultimately be won. Change the mindset at the grassroots level and eventually all this unnecessary non-sense will, one way or another, slowly leave the game. But can we wait that long? Can we afford to lose Sidney Crosby? Do we need another amateur player like Don Sanderson to die on the ice? Do we need another summer of NHL tough guys fatally dropping like flies? With courageous leadership and concerted effort, we can fast-track this over-due movement. But the NHL needs to lead the charge and set the example. The grassroots movement, always in the shadows of the mighty NHL, can only go so far. Proteau offers lots of specifics they can do immediately: educating players, coaches and managers as to the real long-term dangers of concussions; much harsher punishments to hyper-aggressive players; using forgiving equipment; and officiate the game by using the existing rules in the rule book - they've always had the rules to enforce cleaner play, but have chosen to allow far too much gray area. None of these changes seem all that drastic, do they? Hockey is a dangerous game, ever more so due to the speed and size of players involved, and the continued laissez-faire approach to policing the game. Will this book change anything? No, not likely. But every book, every article, every criticism of violence in hockey slowly chips away at the culture that makes all this possible. Like us readers/viewers don't read enough of this garbage on getting rid of fighting on THN magazine and website along with the media, they expect that we'll buy a book on it too? Ha! I'm avoiding this one at all costs. Quite frankly, i'm sick of the media talking about this one, i won't be paying any money for a book merely on this subject matter. Agree with most of what Adam Proteau writes or speaks of on THN Radio Show. Will be reading this one ASAP. Thosewho defend fighting in hockey never say what's good about it. If it deserves to stay in the game let's change the rules so it's no longer penalized. Let's hear it! Why is fighting good for hockey? So? Anyone wanna field that?